The blue spruce is a large tree that grows best when planted in thin relative isolation in a landscape. 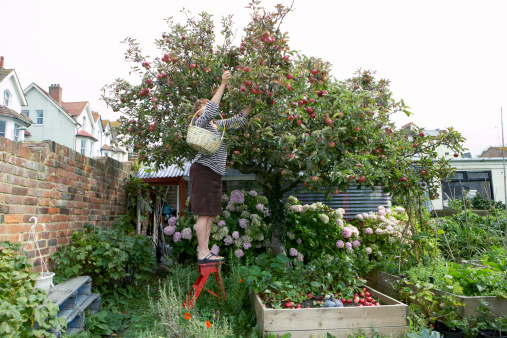 A yearly application of fertilizer to the soil will help keep the tree healthy. 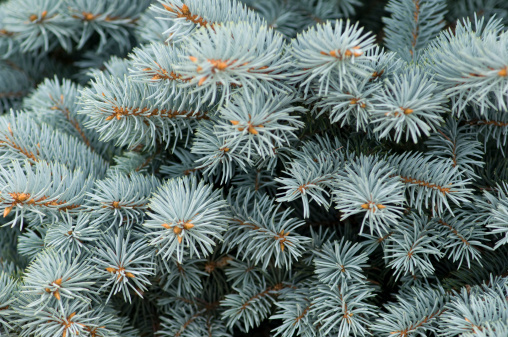 The needles on a blue spruce tree have a blue or silver color tint. The blue spruce is an evergreen tree variety that reaches a height up to 135 feet. The needle foliage is stiff with a blue or silver-colored tint. Blue Spruce trees grow best in USDA Hardiness Zone 3 through 8. The best time to fertilize a blue spruce tree is during the spring season prior to the flush of growth. Do not fertilize the tree in late summer as the tender new growth becomes susceptible to damage during the fall frost. Fertilize a blue spruce tree by applying a slow-release fertilizer rated for conifer trees. Many tree fertilizers are in tablet form and require that you bury them several inches under the soil. Place a 2 to 3 inches of organic mulch over the root ball area of a clue spruce tree helps maintain soil moisture during the hot summer months. The mulch will gradually decompose and provide a natural source of fertilizer to the tree.